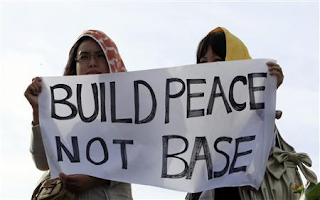 Protesters hold a sign at a mass anti-U.S. base rally in Ginowan, Okinawa on November 8, 2009. (Reuters/Kim Kyung-Hoon)The U.S. military used Okinawa, Japan as a testing ground for biological weapons during the early 1960s while the prefecture was under U.S. rule, Kyodo News revealed Sunday. In over a dozen tests conducted between 1961 and 1962, rice paddies were showered with rice blast fungus to evaluate its threat to rice crops, according to U.S. military documents reported by Kyodo News. The fungus, described by scientists as a ‘threat to global food security,’ causes lesions to form on plants and is estimated to ruin enough rice crops to feed 60 million people each year. Kyodo News reports that similar experiments were conducted in Taiwan, in addition to previously disclosed chemical and biological tests in the United States. ‘The United States is believed to have had China and Southeast Asia in mind in developing such crop-harming agents,’ the report states. For decades, Okinawa residents have resisted the U.S. military on the island, with continuous protests against the presence of U.S. service members, industrial pollution, sexual assaults, and the overall danger of neighboring a military installation. A majority of Japan's U.S. military bases, and half of the 50,000 U.S. troops in the country, are located in Okinawa.